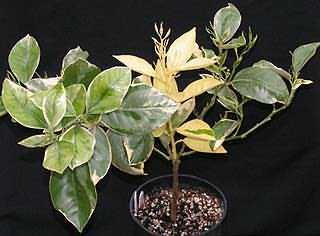 Like other plant species, there are variegated forms of many citrus varieties. These usually arise as spontaneous mutations, or 'sports', which are then propagated for their ornamental value . Spontaneously variegated seedlings occur, and the seeds from variegated species also often produce variegated offspring. 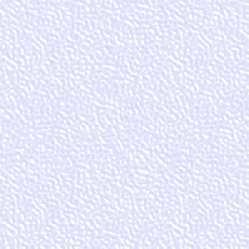 The variegation is due to the presence of cells incapable of producing chlorophyll - areas of these cells are white or yellow. However, leaves are formed from three fairly distinct layers of cells. So the leaf colour varies, depending on which layer or layers contain the abnormal cells. See the diagram below. Citrus seems to produce only unstable patterns on the leaves. For instance, I have never seen citrus leaves that are consistently yellow solely around the edges - the 'aureo marginata' of some plants. Variegation can sometimes be seen starting on young stems and continuing into fruit. 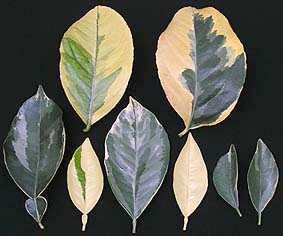 Click here for a useful scientific discussion of plant chimeras and variegation. The diagram attempts to show how two colours in three layers can produce the shades seen on a typical variegated citrus leaf. Variegated citrus are perhaps a little trickier to maintain than standard types. They tend to be less vigorous, the foliage can revert to normal, or shoots appear that have no chlorophyll at all. Both types of shoot can be pruned away. Leaves are more susceptible to sun-burn, and they sometimes have a tendency to distort or pucker, giving nice hiding places for pests. Propagation should be by budding, grafting or taking cuttings. Seedlings will be very variable. A variegated blood orange. Notice how the central shoot is almost entirely yellow. Leaves from lemons (top row), bitter orange (lower left), blood orange (centre three) and kumquat (two lower right). 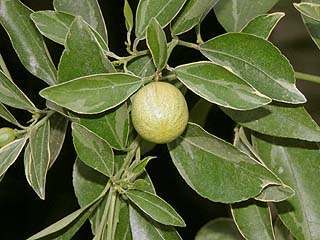 I would love to get some examples of variegated Poncirus trifoliata, and variegated citranges! Can anyone help?